This colossal head, originally formed part of a colossal statue that was up to 10-12 meters in height. The remains, discovered during the papacy of Innocent VIII (1484-1492). 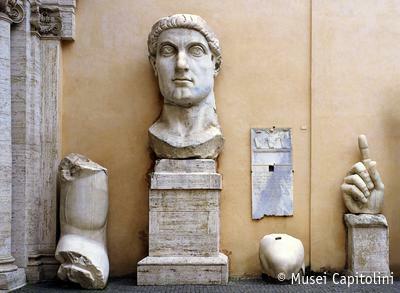 The various fragments were moved to the Capitoline Hill and placed in the courtyard of the Palazzo dei Conservatori during the 16th and 17th centuries. The head, in particular, was first used to decorate the fountain built around the statue of Marforio, and later moved to the courtyard. Some marks of reworking on the head indicate that the authors of this gigantic work made up the features of Constantine using an earlier work, although it is not excluded it may have represented Maxentius, an enemy of Constantine. Only the body parts of the statue that were uncovered were made of marble, of which the remaining fragments are displayed here; the rest was made in less precious materials (stucco elements on top of a wooden framework that served as a core, fabric). This kind of technique is called acrolith. The Emperor shows the features of the most important divinity of ancient Rome, Jupiter Optimus Maximus. In fact, there are many depictions of the god with the bust partially covered by a robe in a similar posture. The latest reconstructive theory shows the figure of the seated Emperor with the upper part of his body bare, the cloak laying on his shoulder. His right arm holds the staff sceptre and his left holds a globe. The colossal head and most of the other marble fragments (arm, hand, knee and right foot, left foot and part of a thigh) belong to a colossal statue of the Emperor Constantine, placed in the Basilica of Maxentius (building located at the east of the Roman Forum along the Via Sacra), dated between 313 and 324 AD.